Max Johnson looks to make a defensive play against Ohio State on 10/27/18. 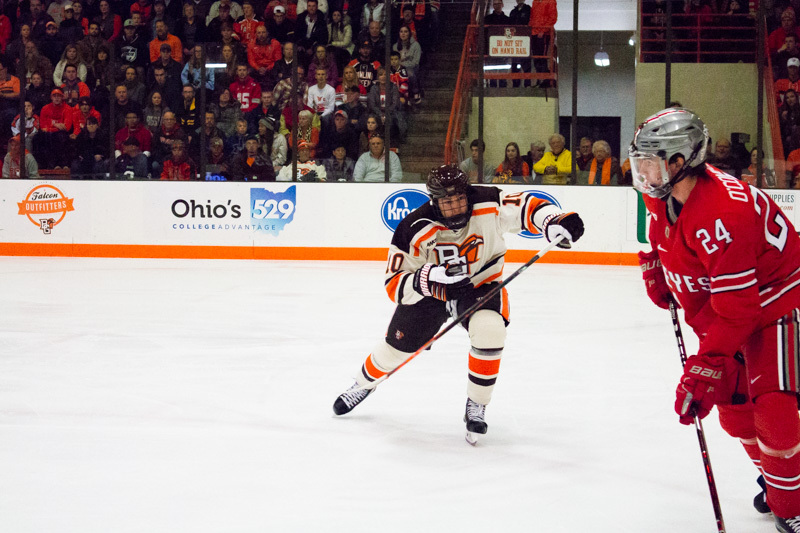 Johnson scored the Falcons' first goal and picked up an assist Friday night (Photo by Jessi Renner/BGSUHockey.com). Big Rapids, MI – The 12th-ranked Falcons took a 2-1 lead into the third period but had to fight back to earn a 3-3 tie against the Ferris State Bulldogs Saturday. Bowling Green earned the extra WCHA point with a shootout win. Ryan Bednard picked up 21 saves on 24 shots faced for the Falcons. Justin Kapelmaster had 16 stops on 18 chances for the Bulldogs before leaving the game in the second period due to injury. His replacement, Roni Salmenkangas, had 15 saves on 16 opportunities. The Bulldogs opened the game’s scoring at 11:30 of the first period on the power play. Lucas Finner’s deflection popped up into the air and fluttered just over the reach of Bednard who had dropped into a butterfly position. The Falcons finished the first period with eight shots on net while the Bulldogs had six chances. Bowling Green cracked the scoreboard at 5:06 of the second period. Brandon Kruse sent a shot on net that was deflected by Brandon Kruse while skating across the slot. The puck lifted up and over Kapelmaster for Johnson’s eighth goal of the season. The Falcons took their first lead of the game at 11:26 of the second period on the power play. A rebound off a shot by Cam Wright came to the right wing where Brandon Kruse netted the shot for his fourth goal of the season. Max Johnson had the secondary assist on the play. Ferris State was forced to replace goaltender Justin Kapelmaster at 14:58 of the second period due to an apparent lower-body injury. Kapelmaster was replaced by Roni Salmenkangas. Bowling Green had 12 shots on net in the second period while Ferris State had eight attempts. The Bulldogs tied the game at 1:46 of the third period. Oskar Andren forced the puck across the goal line after Bednard had made a series of saves but couldn’t freeze the puck. Ferris State again took the lead at 8:43 of the third period. Justin Michaelian fought off a pair of Falcon defenders and beat Bednard with a five-hole shot that seemed to surprise Bednard. The Falcons pushed the game to a 3-3 tie at 17:19 of the third period. Cam Wright skated in on Salmenkangas and buried a wrist shot between the goalie and near post for his fifth goal of the season. Will Cullen had the assist on the scoring play. 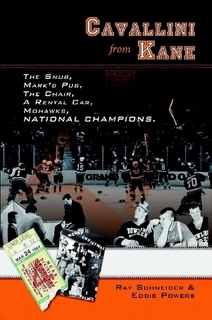 Neither team could score the winning goal in the third period and the game went to an overtime period. Bowling Green had 13 shots in the third period while Ferris State had six attempts. Neither team found the net in the first overtime period and the game officially ended in a 3-3 tie. The teams went to a second overtime to determine who would receive the extra WCHA point. Ferris State had four shots in the first overtime while Bowling Green had two chances. The second overtime ended just as the first did, with neither team scoring. The game then went to a shootout. Bowling Green had six shots in the second overtime while Ferris State had two chances. Neither Max Johnson for Bowling Green and Cooper Zech for Ferris State scored in the first round of the shootout. Taylor Schneider finally broke through with a hard backhand deke to clear space for a goal. Corey Mackin’s attempt was poke-checked away to give the Falcons the extra WCHA point. The Falcons’ record moves to 10-3-3, 5-2-2-2 while the Bulldogs now sit at 4-10-1, 2-6-1-0. The teams will conclude their weekend series on Saturday at 7:07 PM.